When the main headliners for Global Dance were announced a few months ago, already most of us were getting excited in anticipation for Red Rocks Season. 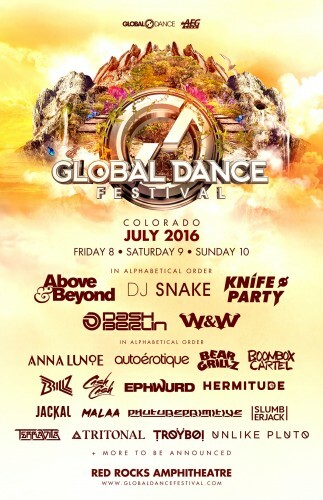 Above and Beyond, DJ Snake and Knife Party were the first round of artists that we found out would be visiting Colorado in July. Of course the minute I see Above and Beyond anywhere I get a rush of emotion to run over me. When I see DJ Snake I know that I am in for a night where I will be dancing till the music goes off and with Knife Party I know I am going to see a great mixture of talent and music that will satisfy almost every music fan. So how did Global get us even more excited for July? By releasing the next round of incredible artists that will be gracing the stage over the course of 3 days! One thing that I love most about Global DanceFestival is that there is a great round of music for so many individuals. Whether you are a bass head, lover of trance, can listen to house music 24/7 or a true trap head Global has you covered. The new line of artists includes Bear Grillz, Cash Cash, Jackal, Brillz, Tritonal and Troyboi plus so many more. With these new additions PLUS even more news to come, I guarantee that Global tickets will start selling out fast within the coming weeks. Tickets are still available and I suggest you get yours ASAP! And no worries, Payment Plans are now available! Get your tickets or payment plan here!